I have attended many of the Zwolle Tamale Fiesta Pageants. I’ve watched a lot of emotional queens say their thank-yous and goodbyes before they crowned another lucky lady. I never imagined that I would, one day, be the one receiving the crown, much less having to say goodbye to probably one of the best years of my life. And what a year it has been! My travels began at the Robeline Heritage Festival. It was my first parade as Tamale Fiesta Queen so it was a memorable one. Shortly after, I was off to Crowley for the International Rice Festival where I met Miss Louisiana and I did some rice threshing. I attended the Sabine Freestate Festival Pageant, and later went back to Florien for the parade and festival. I enjoyed visiting Toledo Nursing Center and playing Bingo with the residents. I then traveled to Colfax, Louisiana for the Pecan Festival. I met some nice people there and they gave me a tour of their pecan factory. I went to Port Barre for the 18th annual Louisiana Cracklin festival where I sampled some homemade Cracklins. The Natchitoches Christmas Bells, Mayor McCullen, and Ms City of Lights met me at the 77th annual Natchitoches Christmas Festival of Lights. I had a lot of fun in the parade and actually had to duck under low-lying tree branches because my float was so tall. The experience closest to my heart was traveling to Shreveport with Martin Crooks and the Harley Davidson Shreveport/Bossier Chapter to go and visit Shriners Hospital for Children. I loved seeing the patients light up from experiencing such simple things. As a former patient of Shriners myself, I will always cherish this experience. Not only was I a visiting queen at the Negreet Miss Merry Christmas Pageant, I was also an auditor. The Many Christmas Parade was the first night parade that I was in. The town of Many looked beautiful lit up with all the Christmas lights. I traveled to Baton Rouge for the annual Louisiana Association of Fairs and Festivals’ Queen of Queens Pageant. I had the honor of being the first Tamale Fiesta Queen to compete in this pageant. There were over 70 queens participating in the four-day event. The first annual Myzoo Pet Parade was very unique with all of the pets dressed up in Mardi Gras motif. I rode in the Battle of Pleasant Hill parade and then went down to the battlegrounds to visit with some of the re-enactors and see the campgrounds. My little brother Kyle drove me in the Fisher Sawmill Days parade. I visited with their new queen and other visiting queens. I enjoyed being back in my hometown for the Zwolle Loggers and Forestry Festival Pageant, parade, and events. The St. Joseph’s Catholic Church annual Spring Festival Pageant was held, and I was asked to be the emcee. This was exciting for me because it was my first time doing something like that. The NSU Folklife Festival was full of history and family. I loved eating watermelon at the Saline Watermelon Festival, and listening to their band play at the street dance. In Bunkie, I attended the Corn Festival, It was a hot day, but it was a good corn shuckin time. I put on my camouflage and headed south for the Gueydan Duck Festival. There were numerous queens there also sporting their camouflage for the pageant and parade. I would like to thank all of you that helped me with my pageant. I was a first timer, so plenty of it was needed. Jodi, thanks for all your help and information, Also thanks to Ms. Debra for creating my beautiful Spanish dress, Ms Roxanne Kezerle and Terri Remedies for doing my hair and makeup. Dr. Garland Miller and staff of Zwolle Medical Clinic sponsored me in the pageant and Ms Connie, my other mom and Marsha was at the pageant to support me. All of your contributions meant a lot to me. Mr. Floyd Giblin…I loved sharing my reign this past year with you. Thank you for riding in the Myzoo Pet Parade and Zwolle Loggers and Forestry Festival Parade with me and helping with the Natchitoches Christmas Festival. It would not have been the same without you there. I had so much fun with you this past year and look forward to even more fun crazy times. You are the best king a queen could ask for! Ms. Brandi Etheridge…you have been such a wonderful pageant director. You helped me with anything that I needed. You also supported me throughout my reign especially in Baton Rouge for the Queen of Queens Pageant. You even provided us with a vehicle for parades when I needed it. Thanks! Mr. Martin Crooks, you saved the day so many times this past year by coming through for me when I needed pictures or more cards. You’re an awesome photographer and I appreciate your kindness. I never realized how much dedication the festival committee had until I attended their meetings. Each one of you have supported me and I couldn’t ask for more. Thank you so very much for your dedication to the Tamale Fiesta and making it the best festival around. All of your support has been greatly appreciated. I have also received a lot of publicity through various media sources. The Sabine Index always ran my articles and put my pictures in the paper. The Sabine County Reporter in Hemphill, Texas also published articles in their paper for me. Rodney Jorden of Sabinenews.com posted my articles on the website. To Mr Tedd Dumas of Baldridge-Dumas Communications, I appreciate your support and use of your studios. Thanks to all of you again! I would like to thank everyone that had a part in my experience at the Queen of Queens pageant. Mike and Debbie Gunter, Ms Linda Webb, and Rhonda Cates decorated my bags for the Queens Exchange Party. St Joseph’s Church allowed us use their hall to stuff all 80 bags. Ms Candi Rivers and her husband Danny, made a stick horse for me depicting the Tamale Fiesta. It was very creative and well done. The Hitchin Post helped me with my western wear for presenting my stick horse. Everyone there was extremely nice and helpful. Susan at Kreations Unlimited created an elaborate wreath for the door decoarating competition. It came out beautifully. Thank you Ms. Ann and Mr. Freddie Rivers for your contribution. I would also like to thank Mr Chris and Ms Becky Loupe of the Tamale Fiesta Committee, Kyle and Emily for traveling to Baton Rouge in support. Thank you all. Special thanks to Nichols for donating materials for my queens bags and queens gifts. Thank you Ms. Debbie and Ms Holly for your help with my queens display. Julian Foy Motors also provided beautiful vehicles for me in various parades. To Ms Ann Etheridge and Ms Lynette Mitchell. Without you two, I probably would have been lost half of the time. You helped me stay up to date with upcoming events, and even helped me get there. Thank you so much for all you did. Scrap Book Cover that they designed for me. They did a great job and I appreciate all of your efforts to make my memory book special! Thanks to all of my weekend sisters. Tiffani and Autumn, what can I say? We had so many fun times this year. I loved it and I will never forget traveling with you. Also to my teen queen Brandi Stout. You are a great girl and I enjoyed attending festivals with you. Heather, you are probably the sweetest person that I know. You are a great queen and I hope you enjoy the rest of your reign. To all of my other weekend sisters, I’ve enjoyed attending your pageants, festivals, and will cherish all of the friendships I’ve made. I would also like to thank all of my friends. You have been there with me when yall could. Meagan, Amanda, Holly and Kyle…you were all there to see me crowned. Special Thanks to Kyle, Morgan, Jarrad and Lacey for the use of your vehicles. Thank all of you for your support, traveling with me, and understanding when I was too busy to return your calls or just hang out. Probably the people that have been through the most with me this past year is my family. Mamma, you helped me keep my head on straight this past year. You never hesitated to help me with anything that I needed, or give up one of your free weekends to travel with me. You’ve been the best, and I know that a mother-daughter bond is something that can’t be broken. To my daddy and little brother Kyle, your came to support me at many events even though I know that the whole pageant scene really isn’t your favorite. Thanks for your support . My big sis Emily, I can’t even begin to tell you how much you mean to me. I think you were about as involved in my reign as I was. You did anything and everything for me that you could do. You traveled to almost every festival and event with me, fixed my hair, drove me in parades, took pictures, loaned clothes, and you were there for me to lean on many crazy times this year and that’s something that can never be repaid, nor forgotten. You helped me out a lot this year even with a pair of two year olds on your hands. To the rest of my family, thank you for attending my ball, helping me with my scrapbook, and attending different events of mine. I am blessed to have such a close and supporting family. I love you all dearly and I wouldn’t be the person that I am today without yall. Above all, I thank God. He has kept me safe this year during my reign and many travel hours. Remember that All things are possible with God. To my successor- this upcoming year you will be surrounded by the best of everything. The best pageant director, the best festival committee, the best weekend sisters, and of course, you’ll be representing the best festival around. Keep your weekends free because traveling is the best part, and if you need any help or a traveling partner, don’t hesitate to give me a call. Also, wear your crown with pride and take time to really enjoy your reign because it will be over entirely too soon. Trust me! 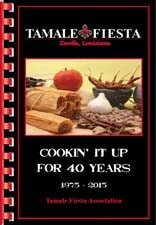 Growing up in Zwolle, I’ve always looked forward to Tamale Fiesta Time. The Tamale Fiesta always brings many visitors, vendors, and families out to enjoy and celebrate this small town’s heritage, and of course our awesome tamales. Being able to be your Tamale Fiesta Queen has been an honor for me. This year has been filled with many wonderful experiences. Thank you for the opportunity and the memories. For the last time, I would like to invite you out to my festival held the second weekend in October. I am and will always be your 28th annual Zwolle Tamale Fiesta Queen, Amanda Kathleen Ezernack. She has two Siblings, Emily Crow of Natchitoches and Kyle Ezernack a student at Zwolle High School along and has twin nephews, Collyn and Clayton Crow of Natchitoches.